122 THE SHOP NOVEMBER 2018 T he objective of any shop event is to promote business and increase sales by energizing past customers, attracting new customers and building stature and company image. 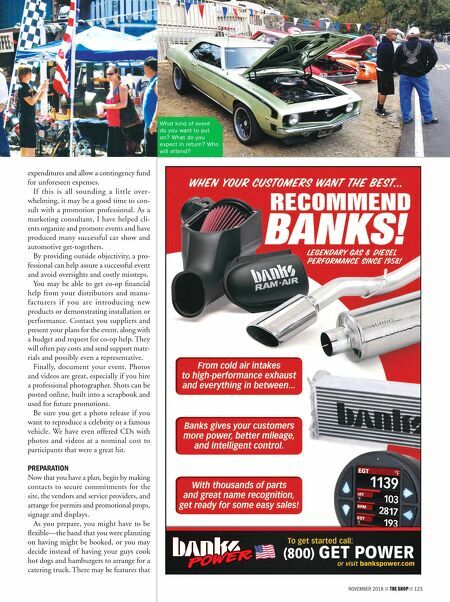 While many shops and service cen- ters have open houses, sales and special promotions, these days businesses are also staging major events like car shows, celebrity promotions, product demon- strations, performance exhibitions and customer appreciation events offsite. Because most shops and auto parts stores are in strip malls, on main streets or in industrial complexes, there is usu- ally little or no adjacent real estate for the business to hold a major promotional event. So, an offsite facility is the answer. In this article we discuss planning, preparation, promotion and production of various types of events. PLANNING This is the first and most important step. Start by determining your objectives. What kind of event do you want to put on? What do you expect in return? Who will attend? Customers? Open to the public? Next you need to select a date that doesn't conflict with another event. Also, check the weather. A nearby car show that was booked for March was rained out. Select a location suitable to accom- modate your event. It may be the local fairgrounds, a parking lot or a private facility. Visit the site and roughly map out where everything will be set up. Remember ample parking and check out amenities like restroom facilities, AC power for sound systems, etc. Make a list of everything that you can think of that will be needed and who will be involved including helpers, security, entertainment and vendors. Check out permits and liability insurance. What about food and beverages? If you are going to be providing complimentary food and drinks and your event is going to be in a controlled access venue where guests are checked in, you will have to arrange for security. T-shirts printed with Event Staff are one idea that identifies helpers. If you are in an open environ- ment, invitees should be provided with a wrist band, name tag or other identifying symbol. This keeps the freeloaders out. You may decide to sell beverages and food, in which case you can hire a profes- sional concessionaire, or apply for permits if you are doing it yourself. You will likely want to offer special pro- motional items and giveaways. These can range from decals to specialty items like T-shirts and caps. Consider coffee mugs, key fobs and other goodies. Some high- ticket items like jackets can be used as spe- cial prizes and even sold. Awards, trophies, plaques or certificates are a great way to recognize achievers. Make sure you have reliable support people and designate them to specific tasks. Meet with your staff to review your plans and event activities. Listen to their input. Associates who feel they are involved and that their opinions are valued will be more committed. As you plan, consider alternatives and options in case something doesn't work out. It is always good to have a Plan B. 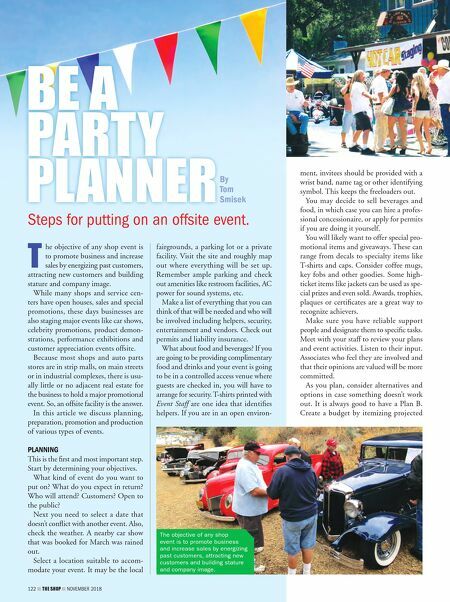 Create a budget by itemizing projected Steps for putting on an offsite event. 122 THE SHOP NOVEMBER 2018 BE A PARTY PLANNER By Tom Smisek The objective of any shop event is to promote business and increase sales by energizing past customers, attracting new customers and building stature and company image.